For the last game I got to face Tom and his Highborn Elves. Mind you, this game was a long time ago and I don’t have pictures of it, so the list might be a bit off. We played flank attack, with Capture the flags as a secondary objective. The fact that the enemy list didn't have any magic and the small scoring units made me optimistic about the result. The fact that I have nothing to threaten the two chariot princes was more alarming, though. Here’s a picture of the deployment (the only one I’ve got, actually). I stalled the princes by deploying deep in the centre (where I had the biggest deployment zone) and pushed the flanks (where my zones were smaller). During the first two turns I focused my shooting on the small swordmasters, managing to kill one unit and panic the other. The Dancers to the left trapped the highborn lancers and forced them to charge (no musician so no way to get away), getting another flag for me. To the right, I pushed my dancer unit aggressively, supported by kestrels. Over the course of three turns, I had to sacrifice a unit of Kestrels, the Briar Maidens and the Dryads to keep the Lion princes honest. In return, I managed to kill both units of Lancers, get an overrun on the Ryma Knights with the big Bladedancers and panic the Queensguard with a root attack. 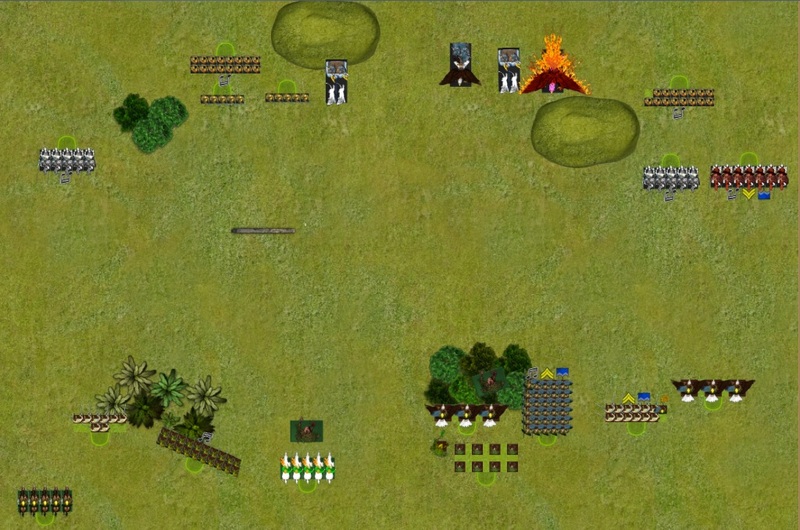 Disaster struck on turn 4: having dealt with the Ryma Knights, the bladedancers were ready to pounce on the 17-strong archer unit next to the hill. However, a combination of their shooting and the stand and shoot reaction managed to kill all 11 Bladedancers, leaving my BSB to fend off for himself. He went into the archer block all alone, failed to even wound once and got cut down by archers for his trouble! In the late game I'd get the phoenix, the second small swordmasters and the queensguard, while my opponent would get a treefather, half of the spearelves and the Kestrels (again, all sacrificed to the Lion Princes). The end result was a draw, but I did manage to preserve all of my scoring units, thus getting the secondary objective: 13-7 win for the Sylvan Elves! It is no secret that sylvan Elves hate Lion Chariot princes. Short of a lucky Crush attack, there’s next to nothing one can do to kill the damned thing, all the while having to sacrifice heaps of units to keep them at bay. My opponent’s list was far from optimized, but the two princes caused enormous amounts of trouble. However, the MVP should go to the archers: they single-handedly dealt with the BD and BSB, for a 1000+ point swing. That’s my chance at a podium finish right there! When the dust settled, I had scored a total of 40/60 battle points. With so many good players in the tournament and a total of around 40 players, not a lot of the games ended in a 20-0, which meant that I was 6th for battle scores. The soft scores (painting/sports) and a nomination for best painted catapulted me all the way up to 4th place, for a very respectable finish! Overall, the tournament was a very positive experience: great terrain/themed tables, smoothly run event, no big rules issues, and a high quality of painting for the most part! All players commented on the lack of time for the second round, but it was a minor hiccup. All in all, great job by the Connectr’ team, I’ll definitely be back next year for the 17th edition! As far as the list is concerned, this tourney helped me decide on some more changes: More magic was definitely welcome, but I lacked a second magic missile to make sure that I have some long-range potential. The small Heath Riders are also something that I'll be leaving home, since they can be easily killed and rarely participate in the battle in any meaningful way other than objectives. But more on that in the next installment, recounting my adventures at the Conquest tournament!